NAIROBI, Kenya (CNN) -- Those most responsible for last year's post-election violence in Kenya may now be punished by the International Criminal Court, after Kenya missed a deadline to address the issue. 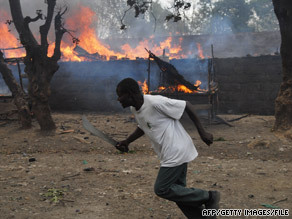 A man runs past a market set on fire in post-election violence in Nakuru, Kenya, in January 2008. Luis Moreno-Ocampo, the chief prosecutor of the court, said in a statement Wednesday that his court will now step in to help Kenya address the post-election violence of early 2008. "Kenya will be a world example on managing violence," he said. Kenya's coalition government promised action after more than 1,000 people were killed following a disputed election in December 2007. Hundreds of thousands were displaced amid the bloodshed. One of the chief promises was the formation of a tribunal to try the perpetrators of that violence. Now that Kenya has missed the deadline, Moreno-Ocampo announced a plan to address the issue. In the statement, he said the International Criminal Court would prosecute those most responsible, and other perpetrators would be subject to "national accountability proceedings as defined by the Kenyan Parliament, such as a Special Tribunal." Kenya will also create "other reforms and mechanisms such as the Justice, Truth and Reconciliation commission to shed light on the full history of past events and to suggest mechanisms to prevent such crimes in the future," the ICC statement said. During meetings with Moreno-Ocampo in July, a delegation from Kenya said that prosecuting those responsible for the violence was necessary to prevent similar acts ahead of the 2012 election.